Now a motion picture: OtherLife. A New York Times Notable Book, Borders Original Voices selection, and Nebula, Endeavour, and Spectrum Award finalist. "Suspenseful and inspiring." --School Library Journal "A stylistic and psychological tour de force." --The New York Times Book Review Jackal Segura is a Hope: born to responsibility and privilege as a symbol of a fledgling world government. Soon she'll become part of the global administration, sponsored by the huge corporation that houses, feeds, employs, and protects her and everyone she loves. Then, just as she discovers that everything she knows is a lie, she becomes a pariah, a murderer: a person with no community and no future. Grief-stricken and alone, she is put into an experimental program designed to inflict the experience of years of solitary confinement in a few short months: virtual confinement in a sealed cell within her own mind. Afterward, branded and despised, she returns to a world she no longer knows. Struggling to make her way, she has a chance to rediscover her life, her love, and her soul--in a strange place of shattered hopes and new beginnings called Solitaire. Kelley Eskridge is a novelist, essayist, and screenwriter. Her stories have received the Astraea Award and been adapted for television. A movie based on Solitaire is in development. She lives in Seattle with her partner, novelist Nicola Griffith. "A knock-out . . . wonderful!" "Solitaire is a novel of our time: a story of dashed expectations and corporate manipulations. Eskridge explores what it means to really see ourselves, and what we are ultimately capable of. Jackal, a slight adolescent, matures into an adult capable of living well, no matter what her circumstances. She is a worthy role model for any reader." "As with Eskridge's short fiction, the vividness of the characters is what makes this book so memorable." "Psychological insights that would warm the heart of Alice Hoffman." "Solitaire" brilliantly explores...the dubious boundary between 'virtual reality' and the act of imagination -- all in the ageless story of a bright, risky kid trying to find out who she is and where her freedom lies. Kelley Eskridge uses all the best stuff -- passion and deception, devotion and betrayal -- to deliver a knock-out first novel. Teen readers who are fond of the genre will embrace Solitaire with ease while fans of YA dystopian titles will find a character who possesses all the cool and quiet power of the best girl hero in a story that is light years beyond the standard fare. Jackal is no wimp or whiner, nor is she a born chosen one. In every way that matters she is the product of the corporate culture (both personally and professionally) that embraced her from birth; she is certainly a twenty-first century construct we can all recognize. The struggles she goes through are always tempered with very personal loss, both as a result of the accident that finds her imprisoned and the distance from the love of her life who remains back on Ko. What rocks so much about Solitaire is that Eskridge has put as much time and attention into her character building as the plot and that means that while we marvel at the world she created, we also respond on a fundamental level with Jackal and the girl she loves who never stops loving her back. This book is a treasure; a true jewel for readers longing for big ideas and intimate story. Solitaire is a novel of our time: a story of dashed expectations and corporate manipulations. Eskridge explores what it means to really see ourselves, and what we are ultimately capable of. Jackal, a slight adolescent, matures into an adult capable of living well, no matter what her circumstances. She is a worthy role model for any reader. As with Eskridge s short fiction, the vividness of the characters is what makes this book so memorable. Psychological insights that would warm the heart of Alice Hoffman. ..".a coming of age story done as psychological thriller: a compelling portrait of a young woman battling both the system and her self after her world collapses, to emerge older, wiser and sadder from an extremely long dark night of the soul." "Takes the reader down to the bone . . . Eskridge's skillful use of detail, her strong characters and evocative settings, and her ability to take her readers on a spiral path to the innermost depths of an individual mind, and then back out again, make this a fascinating read." "Solitaire brilliantly explores...the dubious boundary between 'virtual reality' and the act of imagination -- all in the ageless story of a bright, risky kid trying to find out who she is and where her freedom lies." "Kelley Eskridge uses all the best stuff -- passion and deception, devotion and betrayal -- to deliver a knock-out first novel." "Teen readers who are fond of the genre will embrace Solitaire with ease while fans of YA dystopian titles will find a character who possesses all the cool and quiet power of the best girl hero in a story that is light years beyond the standard fare. Jackal is no wimp or whiner, nor is she a born "chosen one." In every way that matters she is the product of the corporate culture (both personally and professionally) that embraced her from birth; she is certainly a twenty-first century construct we can all recognize. The struggles she goes through are always tempered with very personal loss, both as a result of the accident that finds her imprisoned and the distance from the love of her life who remains back on Ko. What rocks so much about Solitaire is that Eskridge has put as much time and attention into her character building as the plot and that means that while we marvel at the world she created, we also respond on a fundamental level with Jackal and the girl she loves who never stops loving her back. This book is a treasure; a true jewel for readers longing for big ideas and intimate story." 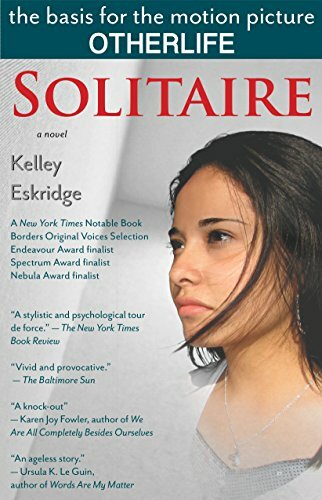 Kelley Eskridge: Kelley Eskridge's novel Solitaire was a New York Times Notable Book and a Borders Books Original Voices selection, and a finalist for the Nebula, Spectrum, and Endeavour awards. Her stories have appeared in magazines and anthologies in the United States, Europe, Australia and Japan, won the Astraea Award and been finalists for the Nebula and James Tiptree awards. Her collection Dangerous Space was published by Aqueduct Press. Her story "Alien Jane" was adapted for television and a film adaptation of Solitaire titled OtherLife was produced by Cherry Road Films. She lives in Seattle, WA.